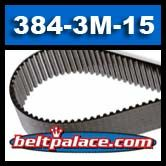 384-3M-15 HTD Neoprene Timing Belt. 384mm Length, 3M Pitch, 15mm Wide. 384-3M-15 HTD Neoprene Timing Belt. Metric Measurements: 384mm Length, 3mm (3M) Pitch, 15mm Wide, 2.4mm Thick. 128 Teeth (Round tooth profile), H Series. Made by BANDO USA.